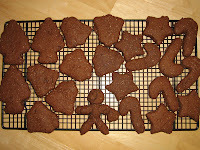 Thanks to Samantha, I now have a photo to show you of the "famous gingerbread cookies". So many people tell me that these are the best they've ever tasted. I assume that most people don't bake their own, so once again are comparing them to store-bought, which just isn't the same! Here's the recipe, which I adapted many years ago from a preschool activity book that I was using with my oldest son when he was 4. He's 15 now! Anyway, I "veganized" it. This makes a big batch to fill at least two cookie sheets, though if you decide to roll it out and use large cutters you may fill three. Combine the two mixtures and mix well to make a dough. To shape, take blobs of the dough with your hands, make a ball for each head, a sausage shape for the arms and a sausage shape for the legs. The head goes onto the cookie sheet, the arms underneath, and the leg piece is curved into a C shape and butted up against the arms. Tricky to explain in writing! Take a look at the cookie in the photo, bottom centre. Alternatively, you can roll out the dough (I do it between two layers of wax paper as it's sticky stuff) and use cookie cutters. You can add currants for eyes and buttons if you want. Bake at 350 for 10 - 12 minutes - I usually bake one cookie sheet at a time on the top shelf of the oven - I know it's more economical to do two at once but then they may cook unevenly. Leave them to firm up a bit before transferring to cooling racks.